I have watched a spider make a web like that one nite. It's fascinating to see it all come together. Beatiful! Perfect October halloweenie picture. Great job capturing it. My pictures of spiderwebs never come out quite right. At our last house, we'd come out the back door in the morning and frequently get tangled in a few web threads dangling from the roof over the step... and always wondered what the little spider was hoping to catch with a web there -- the dog? So glad you're back, Susan! That is a really cool pic. Its wonderous that such small creatures can build something so awesome.thanks again for the nice pics. Popped over via pixie wood .. Webs are one of the things I love about this time of year, seems you have similar wonders in the USA as we do here in Ireland for Autumn (Fall?) 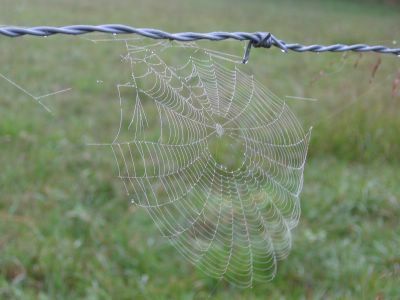 ... spider webs heavily jewelled in early morning dew catching the sunlight, bliss. Beautiful. We have so much wind (and such a constant breeze)that many spider webs are transitory. I must take the camera out back tomorrow and see what's in the woods...where there's no light to take photos. Damn! Ah, loverlie... How delightful, the things that nature gives to us. For us, it is rain and cooler weather. And for those two things, we here in drought-riddled Texas are grateful. Your photographs are always awe inspiring. There are so many cobwebs in our garden at this time of year, but, ours always have a great big fat garden spider sitting in the centre. Have you ever thought of selling your photos? More than once I have come on here and thought "oooh I would love to hang that on my wall"
Hello, Farmgirl - love your daily photos from the farm! I live in wheat country in eastern Oregon, on a ranch in the middle of nowhere. Love the quiet. I have lost a recipe I got from your website - for Unusually or Decidedly Different Oatmeal cookies, that used wheat flour and cinnamon and nutmeg. They were a big hit around here and I'd love to make more. Would you post it again or tell me where to find it? Thanks! 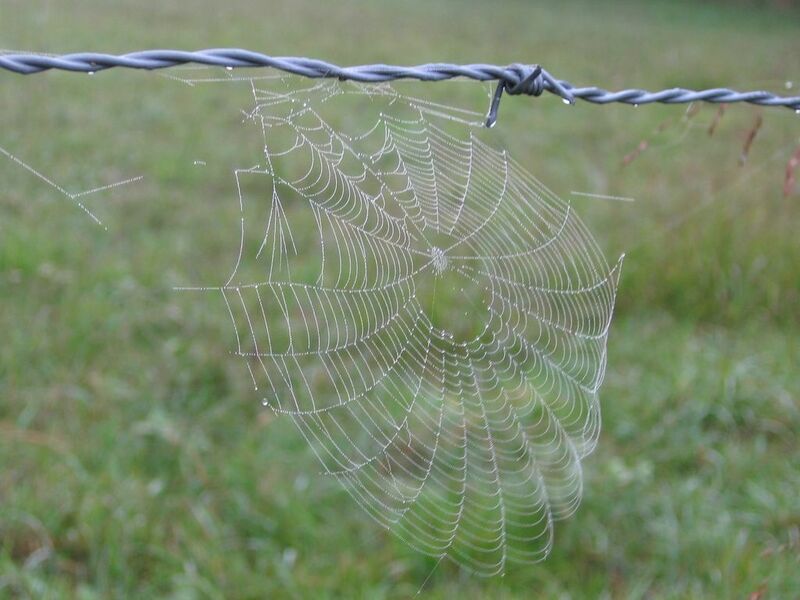 Spider webs are impressive, and this is a beauty. Just in time for Halloween, and big enough to catch a chicken. But we ain't no fools. Better warn Uncle Dan, though- could be he's gullible. Great pic. I wish my garden spiders would return. I have seen 'walking sticks', though, so I haven't run all the critters off. I don't like to find webs that are higgledy-piggledy,though. Because where I find those, I find a not-so-kind, not-so-sweet little lady with a red hourglass. Those are not on the catch and release program. Thanks for taking the time to write. I loved reading about all of your own spiderwebs. I've noticed that, for me, spiderweb photos seem to come out best on cloudy days--even though they always look so spectacular shimmering in the sun. Spider webs never cease to amaze me. Especially when you realize some of the spiders remake their webs every single night. Thank you so much for the compliments. Yes, I am in fact in the process of creating some items for sale that incorporate my photos--like greeting cards. I'll be writing more about this (and asking for opinions/comments) soon. I apologize for taking so long for me to get back to you. The cookies you want are what I call Farmgirl's Decidedly Different Chocolate Chip Cookies (they don't actually call for oatmeal, but I bet they'd taste great if you tossed a little in). The recipe can be always be found in the sidebar under PREVIOUS POSTS: FOOD STUFF. The name of the link is CHOCOLATE CHIP SHEEP & CHOCOLATE CHIP COOKIES. Or you can just click here. Enjoy! P.S. Your farm sounds great. If you would just stay in your deluxe coop you wouldn't have to be worried about getting caught in a spiderweb. And is that any way to talk about Donkey Doodle Dandy? Shame on you two. And today somebody asked why I don't post more stories and pictures about you. I love those walking sticks. They are really cool looking--and so hard to see. I'm always afraid of stepping on them when I'm walking through the woods.